The Chicago Zoological Society, which operates Brookfield Zoo in Brookfield, Illinois, got into the Halloween spirit a little early this year with the 3rd Annual Eden Place Pumpkin Festival. This event, which took place October 17, is an interesting example of how successful and rewarding collaboration can be when a museum is willing to take the risk. 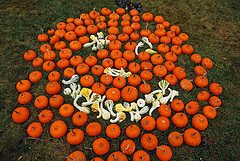 The Eden Place Pumpkin Festival, which counts the Illinois Department of Natural Resources and the Illinois Legislative Black Caucus as other organizing partners, is an effort to provide opportunities for urban youth to engage with nature and ultimately create a new generation of conservationists. Click here for more details on the event. Jo-Elle Mogerman, Vice President of Planning and Community Affairs at Brookfield Zoo, was kind enough to share a little bit more about how the partnership developed, the aims of the Eden Place program, and how sometimes a museum’s mission is met outside the confines of your institution. 1) How did this partnership between Brookfield Zoo/Chicago Zoological Society, Illinois Department of Natural Resources, and the Illinois Legislative Black Caucus form? Through our government affairs staff, we had the opportunity to discuss the Society’s efforts to engage African-American youth in education programs focused on wildlife and nature to inspire the next generation of conservation leaders. 2) How many years has this event taken place? The Chicago Zoological Society has been involved with the Eden Place Pumpkin Festival for the past three years. 3) Why did you choose the red-tailed hawk and great horned owl as the animals for this event? In the end, our red-tailed hawk and a dog visited Eden Place. Both the red tailed hawk and great horned owl are native travel well and are Illinois species that you might even find in urban areas like Chicago neighborhoods. Both the dog and hawk were a big hit with the children and families. Many children don’t have pets and the dog provided an opportunity to get up close and pet it. 4) The Annual Eden Place Pumpkin Festival seems to place a strong emphasis on creating conservationist of the future. How do you approach educating children about conservation? Is the emphasis on building positive connections with nature rather than focusing on some of the more negative problems affecting the environment? Does the approach change depending on the age or gender of the child? You are right, the focus is on building positive connections and transferring the great observation skills many urban children have to explore nature and science. For example, for leaf necklaces the kids had to find the fallen leaves they wanted to make their necklace out of. Some of the other activities were pumpkin painting where we encouraged kids to express their thoughts about fall, animals or nature. In the planting activity, we helped the kids plant a plant in a yogurt cup. For family programs like the harvest festival, we try to bring activities that are interesting to families, where the parent can choose to assist. We remind the parents about the activities they can do at home. The Society’s Center for Conservation Leadership provides age appropriate programs and activities both at the zoo and beyond to inspire the next generation of conservation leaders. 5) How do these children continue learning about conservation and nature after the event? We try to gear at least one of our activities to be something that can go home with the kids. This year they took home their painted pumpkin, leaf necklaces and plants. This provides an opportunity for continued learning at home through watching the plant grow or having family conversations about the activities and the day. 6) The Eden Place Pumpkin Festival aims to take urban kids and their families and introduce them to nature in a non-urban environment. Is there any future or existing program that deals with nature within an urban environment? As a zoo, how do you address the fact that many of your visitors live in or near a large urban area? We partner with Eden Place through our Grassroots Zoo program funded by The Field Foundation. The Pumpkin Festival is just one of a series of programs that we work with Eden Place staff to provide to the community. We understand that many of our guests come from large urban areas. We provide guests the opportunity to see animals up close, talk with our keeper staff through keeper chats and in exhibits like Hamill Family Play Zoo and the Children’s Zoo even touch them. In addition, interpretation through signs and youth and adult volunteers provide additional opportunities to connect with the animals and even the grounds. The Zoo grounds themselves, provide even more opportunities to just be in nature in a safe place. 7) How does Brookfield Zoo plan on using this event to draw in visitors to the zoo itself? What other external programs of this nature do you partner with? Our mission is to inspire conservation leadership by connecting people with wildlife and nature. We believe inspiring conservation leadership doesn’t have to lead you to the zoo. Therefore, for events like Eden Place Pumpkin Fest, we use Brookfield Zoo as a hook to draw people to the festival so that nature connections can begin but not necessarily draw those program participants to the zoo. We hope or presence leaves a good impression with them and if they want to come to the zoo great! We have another community based organization partner for Grassroots Zoo, the Juan Diego Community Center. 8 How do you hope to measure the success of this event? Turnout at the event itself? Subsequent visitors to the zoo? Or is it something more long-term, like an increase in the number of individuals from urban areas working in conservation related fields? 9) And one last question that is not about the event: why is the Chicago Zoological Society’s logo a buffalo? Thanks again to Jo-Elle, and we hope that this partnership is only one of many interesting museum collaborations to come.